California’s a great place, but the summer’s can make it hard to wear a hair system. At Farrell California we are experts in making hair systems for the California climate that look, feel and breathe like your own natural hair. 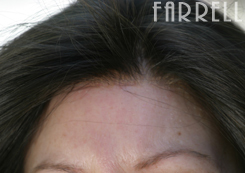 At Farrell California we strive to make our systems look like your own growing hair. This means that we make the systems to match your own hair's exact density. We give you back your original hair line, growth patterns, gravity splits, your exact original density, texture color and many other elements that collective work with your bone structure and gravity like magic. 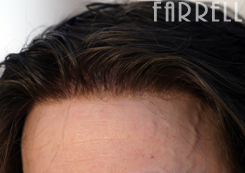 At Farrell California we strive to make our systems look like your own growing hair. This means that we make the systems to match your own hair's exact density. If your density is light or light/medium or even medium density, a little hair loss can be fairly noticeable to you. With hair systems for both men and women suffering from the devastating effects of hair loss. Farrell California hair systems are virtually undetectable to both sight and touch and are hand made with the highest quality human hair available. We produce hair replacement systems that appear as though the hair is growing right out of your scalp. With a Farrell California hair system, you can create any hairstyle you wish including those that allow you to comb your hair back and away from your face exposing your entire hairline. These are results that cannot be achieved with expensive and invasive hair transplant surgeries or with potentially dangerous chemicals such as Propecia and Rogaine that have never grown back even one full head of hair. Consultations are by appointment, so you can call the toll free number or simply fill out the form below. We will help you reach your esthetic goals and your hair loss will be a thing of the past. Then you can enjoy the benefits of having all of your hair back. We understand that your busy, so you tell us when it's convient for you and our professional (and discreet) client service representative will call or email you, which ever you prefer. Even though I know that your operation is a business, there seems to be an amazing charitable and human interest element to your work which I am sure gives both you and Laura a great deal of personal satisfaction. Yesterday marked a bit of a turning point in my life in terms of restoring my social and professional confidence and removing a gray cloud from daily existence. Again, I would like to express my sincerest gratitude for your time, talent, skill, effort and attention yesterday. We started rehearsals yesterday and I want to share with you what all went down because I obviously had to tell them about my hair. My hair dresser could not believe that I was wearing hair and she has worked in the film industry for many years. She said it was the best she has ever seen. I know that having my beautiful hair helped me to land this job because when I look pretty, I feel pretty and act pretty. My dancing never has held me back like my feelings have in the past. I have Laura and you to thank. I can truthfully say that Richard is also a perfectionist. And though perhaps I may have driven him crazy with small details, he never got annoyed. (Or at least if he did, he never let me know it). He worked very hard to meet all of my expectations. They say a picture is worth a thousand words. I cannot come up with any more word other than: Thank you Richard, for your hard work and superior product. It is indeed amazing, and as close to the real thing as you can get.